Spanning 510 feet long, 86 feet wide, and 94 feet high, a life-size Noah’s Ark replica is nearing completion in Kentucky. Colorado Timberframe was uniquely able to create the complex timber frame for the project due to their recently upgraded specialized sawmilling and CNC equipment. A Wood-Mizer portable sawmill onsite for additional construction needs. We were the only company that can do the sizes of the timbers that they had, and actually fabricate all the timbers on the machines. The mammoth Ark Encounter project is being recognized as the world’s largest freestanding timber frame structure, with a total of 3.1 million board feet of timber used in its construction. A football field and a half long, the volume of the Biblically scaled Ark is the equivalent of 500 standard semi-truck trailers, and features three levels of exhibits, with a 1,600-seat restaurant being prepped on the top deck. The Ark’s maximum capacity is 10,000 people, however once it opens to the public, organizers plan to limit it to 3,000 inside at any one time. To meet the construction deadlines, Colorado Timberframe hired additional help, and transitioned to a three-shift work schedule for 6 days a week for an entire year. A number of 25 employees worked in the workshop just outside of Denver while 10 more were onsite to install the timber frame project in Kentucky, along with 75 Amish craftsmen employed by the main construction contractor. “We had the capability of doing this entire project, as we have recently upgraded our equipment,” said Keenan Tompkins, owner of Colorado Timberframe. “We were the only company that can do the sizes of the timbers that they had, and actually fabricate all the timbers on the machines.” In addition to more staff, Mr. Tompkins said that several machines were vital to fulfilling the unique orders and meeting the tight construction deadlines. An extended personal sawmill manufactured by Indiana-based Wood-Mizer Sawmills was used to resize rough-sawn 24”X24” beams of up to 40 feet long to the exact dimensions required for the complex structure. The LT15 model sawmill used for the project is among the smallest bandmills Wood-Mizer offers – the standard model fitting neatly into the bed of a pickup truck. “50% of the timber had to be resized,” Tompkins said. “So that’s where we really worked the Wood-Mizer for a year. 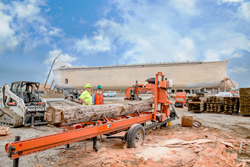 We had one full-time guy resizing timbers for the Ark project." "Then the timber went through the K2I Hundegger CNC machine,” said Tompkins. “We have a four foot wide track, and it can do four foot wide to up to 20 inches tall, and 60 feet long. It does all the mortise and tenon joints, as well as drillings and slot cuts, and any kind of recesses or notches that the timbers need to accommodate either the wood connections or the steel plates.” The German-based Hundegger company supplies a wide range of industrial woodworking equipment. The Ark Encounter was opened to the public July 7, 2016 in Williamstown, Kentucky. More than one million people are estimated to visit during the first year, and additional Biblically themed attractions are already in development for the future.